E-Z STEER offset triple trees recommended by Rix Eden for more stable handling on the open road. Machined from billet aluminum & features a 5 1/2 degree rake over the stock motorcycle. 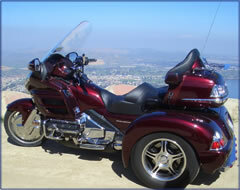 The triple trees provide trike owners with the feeling of "power steering." They come complete with new lower bearing & install using the stock fork tubes. CHROME LIGHT BAR is constructed of heavy guage steel then finished in high-luster chrome. This light bar will enhance visibility in traffic. The trike's styling would have to match that timeless design of the best Honda could offer. The suspension would have to be designed to endure high speed and be agile enough to avoid unexpected driving hazards, yet ride comfortably in undesirable road conditions. And our engineers knew our trike would have to be just as reliable and dependable as Honda's superb machine. That's exactly what we accomplished with the Champion GL1800 trike kit. Ride a new Champion GL1800 trike kit and find out how the Champion engineers worked with Honda's design to produce the most exhilarating trike kit available to date! UPDATED 5 1/2 DEGREE FLHT SERIES TRIPLE TREE now fits a wider range of Renegade conversions for Harley-Davidson FLHT models from 1997 through 2009. 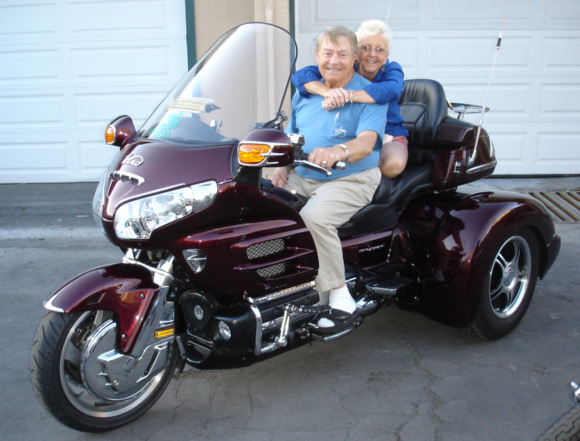 Made of aircraft grade aluminum with a machine finish, it has been designed especially for the Renegade to meet SO CAL TRIKE CENTER'S quality standards! PROGRESSIVE SUSPENSION FORK SPRINGS are recommended if you do not have them already. If you do, let's check the spring rating to be sure of the best handling. THIS REVERSE GEAR is designed specifically for Harley-Davidson to make parking and general manouvering much easier. The third wheel adds extra stability, making you less vulnerable in the event of an emergency and means added visibility on the road. The third wheel also allows most anyone to balance even the biggest motorcycles, which means that starting and stopping your bike couldn't be easier. ROOMY TRUNK with drink holders in the lid. How convenient is that? Remember that boxer jumped in before you take off! CHAMPION'S TRACKING INCREMENT LEANOUT TECHNOLOGY allows you to adjust the lean-angle of the motorcycle with the flick of a switch, in order to compensate for changing conditions. THE DEGREE TO WHICH A SIDE CAR TRACKS TRUE down the road is affected by road conditions, wind, varying weight loads and other variables. A change in one condition can cause an otherwise well-balanced rig to pull to the right or left. 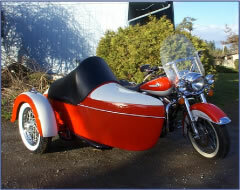 Most motorcycles 750 cc and more are capable of being converted to a side car rig successfully. 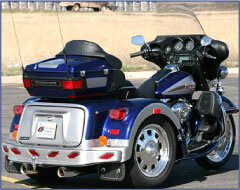 When it comes to touring trailers for your trike the new Lehman Drifter™ is here for the long haul. The Drifter™ features everything you want in a trailer and more! With 23 cubic ft of storage you'll have plenty of room for any size trip. 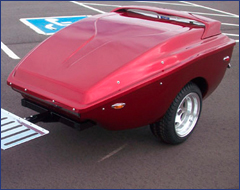 Despite its large capacity the Drifter™ has lowest profile of almost any trailer in its class. If it's a smooth ride your after check out Road Dog's own pivot point torsion suspension. With its longer trailing edge swing arm, coupled with the low profile and wide stance, the Drifter™ stays glued to the road under any condition. CHROME COOLER RACK: A great way to make your Road Dog really stand out! CHROME GRAB HANDLE: Dress up the Backside with a Chrome Plated Grab Bar for your Road Dog trailer. SPARE TIRE and FITTED BAG presents your spare in style with a custom Road Dog Embroidered Bag! Most bikes can happily pull a trailer with the right hitch and mount. Stow heavy items like ammo low and over the axles. Trailer shown with optional color matched spoiler. The Widetrack Leatherback has a top covered in black leather for the really complete look of luxury. see the RIX PICKS section in the right sidebar! 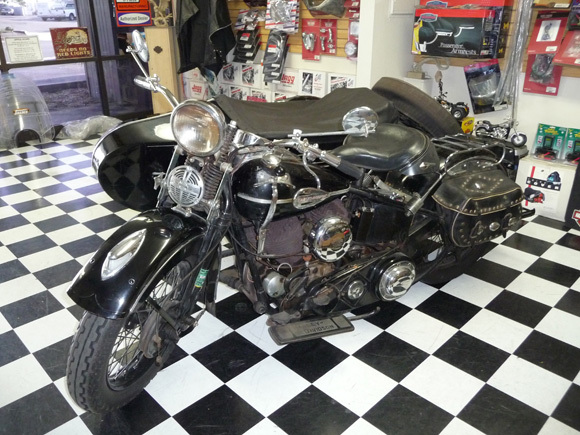 But check out the unrestored 1939 Harley UL with 1945 sidecar in our show room today. Click image for details.